There’s a fair bit of confusion around the word ‘modern’. It is often confused with ‘contemporary’ and some kitchens are described using both words. So, just for some clarity – modern refers to a style that is devoid of decorative detail. It is sleek, functional and has minimal or no clutter. Contemporary is simply what is currently in fashion – and that can be anything – modern, industrial, retro or French provincial. Now that’s just definitions. Modern, identified by simplicity and functionality, is by no means plain Jane. Contemporary modern design is all about infusing drama, layering colours and personalising the space. This post looks at a few variations of the modern kitchen. Here’s one from our Richmond showroom. 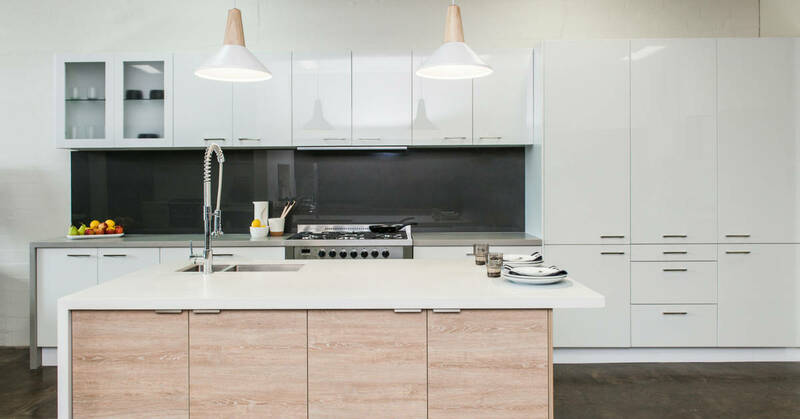 Straight, clean lines, achieved through handle-less cabinetry. Simple solid colours – black and white. The white New York subway tiles have grey grouting giving them definition. The quality of the materials used shines through. This is a no fuss, no trims kitchen. It is all about stylish functionality. The modern kitchen is also a well-planned kitchen. There is a designated spot for everything. If you’re looking at breaking the white with a bit of colour, here is a kitchen we did recently. 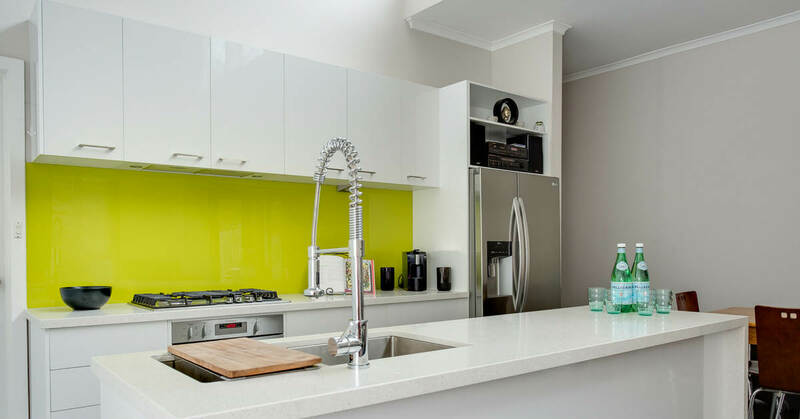 The stunning splashback adds vibrancy without detracting from the modern design. The high-gloss paint with its reflective quality adds to the illusion of space in the otherwise small kitchen. Scandinavian design and furniture have been hugely popular all of 2017, and architects and designers are adapting it in new and exciting ways. This kitchen is one we did for a client recently. The use of blonde timber adds warmth to this white kitchen and the island bench ties in to the long timber dining table and Eames chairs. This kitchen has a very strong Scandi vibe that’s all about clean lines, warm materials and feature lighting. It has character within a clutter-free environment. This one is from our Richmond showroom. Elegant pendant lights with timber accents and timber base cabinetry for the island bench add warmth to a classic modern kitchen. If you’ve got a home that is very modern in styling and flamboyant, the kitchen can carry its own weight. Like this one here from our Qualia range. 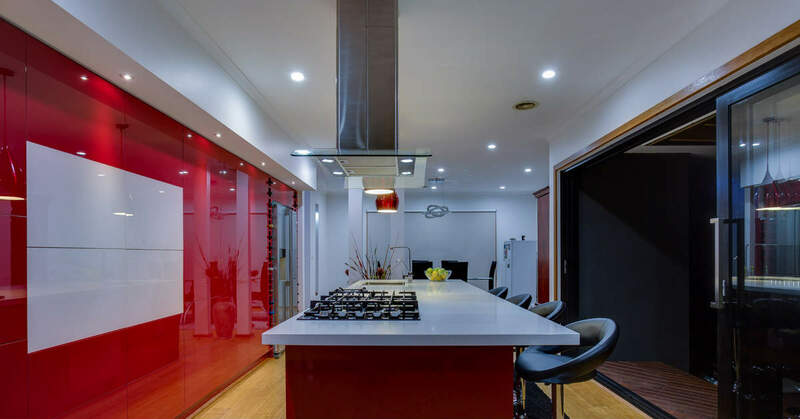 The wall of red concealed cabinetry highlighted by the downlights is contrasted by a wall of black cabinetry. The range hood adds to the drama of the space. Glossy and glamorous. Why does this kitchen come together so well? Handle-less cabinetry, gloss finish, clean straight lines, accessories and lighting that are a perfect match. This is a great example of how staying faithful to the chosen style achieves the perfect outcome. A contemporary trend worth exploring is combining a modern kitchen with one feature element that creates a focal point. Splashbacks and island benches are great for creating impact because they are dimensionally prominent. Like this one from our Richmond showroom. The Moroccan-style tiles lift the space from ordinary to exotic. The timber base cabinets created a layered effect and will ease the transition into living areas. 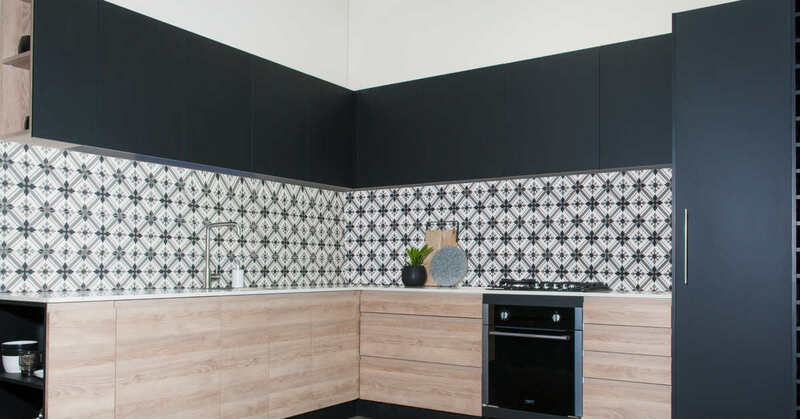 A feature benchtop is another great way to stamp personality into the kitchen, especially if it is large and is designed as part of the living space. Concrete is one stand-out material that always wows and thanks to The Block – very popular. It has a hard, industrial edge to it, but can be softened by gradients in the grey textural patterns. These patterns themselves can be quite striking. It is rough, but very sophisticated at the same time. 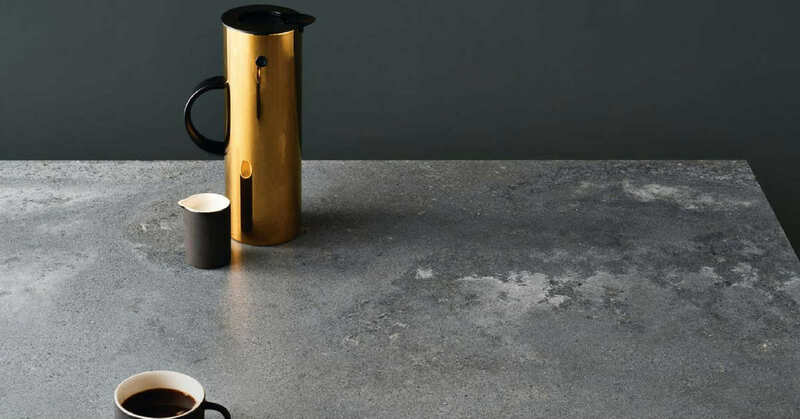 This is Caesarstone’s new rugged concrete which delivers the authentic look of hand poured concrete. We always tell our clients that buying a new kitchen is all about their needs and personal taste. 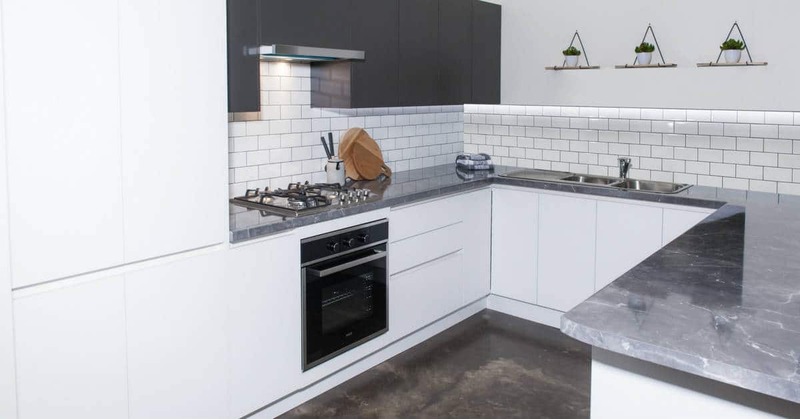 At Zesta Kitchens, our designers are always on hand to guide you, make recommendations, inform your choices and help achieve the look you want. Contemporary modern kitchens accommodate a lot of variations, so use the knowledge of the designer to build your dream kitchen.